The port operator Sharjah Seaports Authority from the United Arab Emiratescommissioned a brand new Demag AC 100-4L all terrain crane. The purchase was made through the authorized Terex Cranes distributor Al-Bahar, which also has its headquarters in the United Arab Emirates. 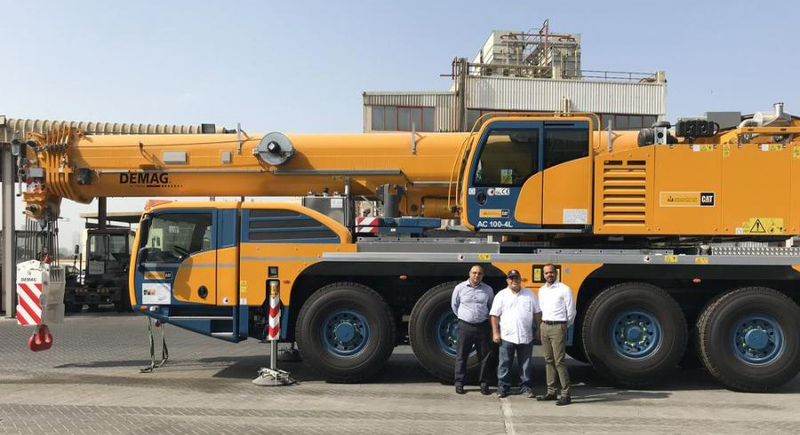 “We have chosen the Demag AC 100-4L because of the excellent reputation of this brand,” said Eng Ahmed Bin Ahmed, marine engineer and head of plant at Sharjah Seaports Authority. He also mentioned the excellent service provided by Terex Cranes and Al-Bahar as further reasons for his company’s decision to buy. The operation site of the new crane will be Sharjah Port Khalid. The port operator Sharjah Seaports Authority, based in Sharjah, manages the three major deep-water seaports Sharjah Port Khalid, Port Khorfakkan and Port Hamriyah, which form the most important trading gateway to the United Arab Emirates. With a total of 33 berths, the ports are capable of handling cargo ships of all sizes and all conceivable goods. Approximately 6,500 ships dock in the three ports each year, loading and unloading over ten million tons of bulk goods and more than 2.5 million 20-foot containers. Founded in 1937, Al-Bahar, with around 3,000 employees, is one of the most successful authorized distributors and service providers for large machines in the entire Middle East. The product portfolio comprises a broad spectrum of equipment from leading international manufacturers for construction and infrastructure projects of all sizes as well as for projects in the fields of energy, material transport, waste disposal and logistics. The company is headquartered in Sharjah/United Arab Emirates and has branches in Bahrain, Oman, Kuwait and Qatar.